Native. Perennial. Propagates by seeds. Time of bloom: June to August. Seed-time: August to October. Range: Virginia to Arkansas, and southward to the Gulf of Mexico. Habitat: Rich moist soils; woodlands; tobacco, corn, and cotton fields. Stem erect, rigid, hairy, one to two feet high, simple or with a few forking branches. Lower leaves four to ten inches long, two to four inches wide, and spread flat on the ground; they are broadly obovate, blunt-pointed, tapering to the base, heavily veined, scallop-toothed, and softly woolly-hairy all over. 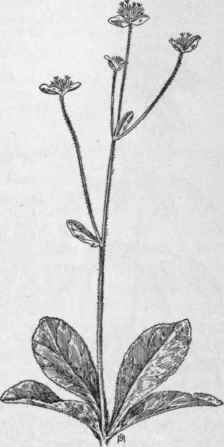 Simple stems are usually leafless, but where forked there is a small, sessile, lance-shaped leaf. Heads two- to five-flowered, the florets all alike, fertile, tubular, five-lobed but deeply cleft on the inner side, pale purple. Below each head are three heart-shaped, large, leaf-like, and hairy bracts. Achenes oblong, ten-ridged, with a pappus of stiff, slender bristles. Fig. 290.-Hairy Elephant's Foot (Elephantopus tomentosus). X 1/4. In crops where thorough and late cultivation may be practiced, this weed is not difficult of suppression; but in tobacco fields, where care must be exercised in order to keep the large lower leaves of the crop uninjured, late tillage is a danger, and hand-pulling is the only practicable way of destroying late-blooming plants before the development of seed.